LAST WEEK'S CNN debate between Ted Cruz and Bernie Sanders on the future of Obamacare was a first-rate political broadcast. It was substantive, focused, and illuminating — an absorbing clash between senators representing two very different ideological approaches. It was everything last year's shallow, bicker-filled presidential campaign "debates" were not: political programming that genuinely left viewers with more insight into a pressing question of public policy. One segment of the two-hour encounter was particularly revealing. "We employ between 45 and 48 employees," she began, explaining that she wanted to open more salons and employ more people. "However, under Obamacare, I am restricted, because it requires me to furnish health insurance if I employ more than 50 people. Unfortunately, the profit margin in my industry is very thin, and I'm not a wealthy person. . . . My question to you, Senator Sanders, is how do I grow my business? How do I employ more Americans without either raising the prices to my customers or lowering wages to my employees?" 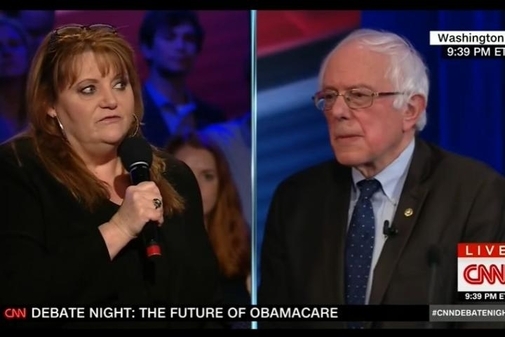 LaRonda Hunter, the owner of hair salons in Fort Worth, Tex., posed a question to Senator Bernie Sanders during the CNN debate on the future of the Affordable Care Act. Here was a real-world example of Obamacare's impact. By compelling companies with 50 or more workers to offer health insurance to everyone they employ, the law creates a powerful disincentive for business owners to expand beyond 49 employees. A business owner like Hunter faces an impossible dilemma: Either give up on growing her enterprise, or try to make ends meet by charging customers more and paying workers less. The onerous employer mandate is one of the Affordable Care Act's worst defects. The Obama administration repeatedly delayed its effective date; Republicans want it repealed altogether. Sanders must know that Hunter's predicament is not uncommon, and the CNN debate gave him the chance to explain how Democrats propose to address it. But his explanation amounted to: Tough. "Let me give you an answer you will not be happy with," Sanders said. "I think that for businesses that employ 50 people or more, given the nature of our dysfunctional health care system right now, where most people do get their health insurance through the places that they work, I'm sorry, I think that in America today, everybody should have health care. And if you have more than 50 people, you know what? I'm afraid to tell you, but I think you will have to provide health insurance." Hunter tried again: "How do I do that without raising my prices to my customers or lowering wages to my employees?" Sanders: "I certainly don't know about hair salons in Fort Worth. But I do believe, to be honest with you, that if you have more than 50 people, yes, you should be providing health insurance." The exchange could not have been more enlightening. For entrepreneurs like Hunter, a mandate to supply health insurance triggers inescapable, and unignorable, consequences. For Sanders and other defenders of Obamacare, those consequences are irrelevant. They believe in the employer mandate — a belief impervious to facts on the ground. Lawmakers so often enact far-reaching rules with worthy intentions, but little awareness of how much harm government burdens can cause. 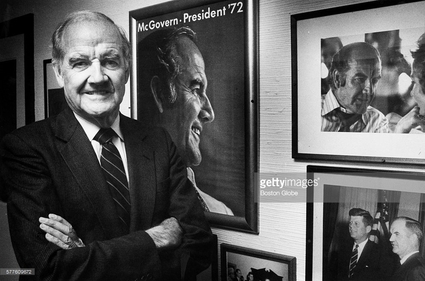 George McGovern, posing in 1989 at the Stratford Inn with posters and photographs from his political career. The Connecticut hotel, which McGovern bought after leaving the Senate, later went bankrupt. Sometimes, belatedly, they come to understand how clueless they had been. As a congressman, New York's Ed Koch routinely voted for liberal social and welfare proposals. Only much later, after leaving Congress and observing the practical impact of all those rules and programs, did the scales fall from his eyes. "I was dumb," Koch told an interviewer in 1980. "We all were. I voted for so much crap. Who knew? We got carried away with what the sociologists were telling us." Years later, an even more liberal Democrat expressed similar regrets. After a long career in Congress, former Senator George McGovern tried his hand a running a business — a small hotel in Connecticut. "In retrospect," McGovern wrote after the inn went bankrupt, "I wish I had known more about the hazards and difficulties of such a business. . . . I also wish that during the years I was in public office, I had had this firsthand experience about the difficulties business people face every day." Government's power to do good is limited, and heavy-handed regulation habitually proves counterproductive. If Bernie Sanders had operated a few hair salons before going into politics, he would know that, and he'd be a better senator as a result.